The New Politics of Class by Geoffrey Evans and James Tilley is a new and noteworthy contribution to the huge literature on the impact of social class on voting and elections in Great Britain decision and other important developments in contemporary British electoral politics. In their book, Evans and Tilley boldly revive the class politics debate and argue that their findings have relevance for understanding public support for parties such as the SNP and UKIP and the historic Brexit decision voters made in June 2016. The basic observation of the book is that the strength of the relationship between social class and voting in Britain has declined greatly since the 1960s when the first British Election Study (BES) was conducted. The erosion of historic ties between the working class and the Labour party has been accompanied by a significant decrease in turnout among working class voters. Evans and Tilley contend that the decrease in class voting occurred rapidly in the 1990s, coincident with Labour’s decision to rebrand itself as ‘New Labour’ and enhance its ideological/policy appeal to the growing middle class of post-industrial Britain. It bears emphasis that for Evans and Tilley the decline in class voting and the decrease in working class turnout largely are consequences of changes in the ‘supply-side’ of party politics. As the authors put it: “Class divisions in social attitudes and political preferences remain robust. It is the political parties that have chosen not represent these class differences. This has led to a decline in class voting, but also an accompanying accentuation of class divisions in non-participation.” The merits of the supply-side argument are discussed in more detail in my article for The Political Quarterly. New Labour’s failure to offer working class voters attractive policy choices is the key example here, but the 2017 election can also be viewed as an interesting test case for Evans and Tilley’s supply-side argument for the decline in class voting. If they are right, then one might expect that the old-line socialist policy appeals articulated by Labour leader Jeremy Corbyn would have generated a surge in working class support for Labour. In the event, the party did enjoy a marked increase in support (from 30.4 per cent to 40.0 per cent of the UK popular vote), but available survey evidence suggests that this was largely a result of a huge increase in turnout by young people of all classes who were very enthusiastic about Corbyn and his message. 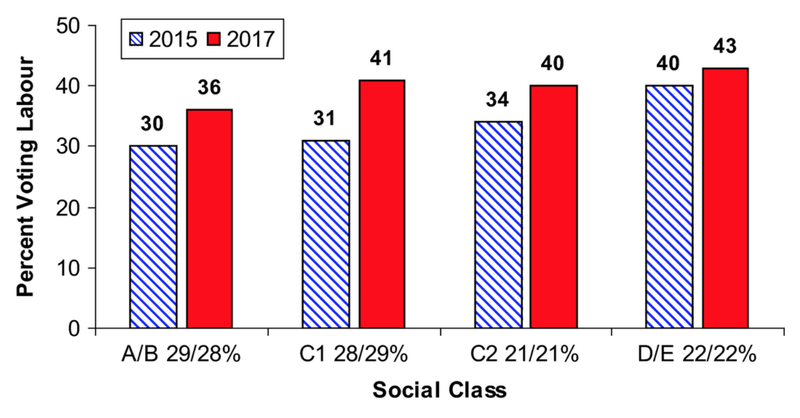 In contrast, survey data displayed in Figure 1 show that increases in Labour voting between 2015 and 2017 occurred in all classes as measured by the standard Market Research Society social grade classification with the largest increases occurring in the lower middle class (C1) group and the smallest in the unskilled working class and unemployed (D/E) group. There clearly was a class gradient to Labour voting in both 2015 and 2017, but it actually was larger in the former election than in the latter one. Evans and Tilley might respond by pointing to their hypothesis that Corbyn’s appeal to working class voters was likely limited by his social liberalism, which does not resonate well with many working class people. In this way and many others besides, the book points in multiple interesting directions for future research. Equally, it is an engrossing read for anyone interested in political choice in Britain. This article is adapted from a piece in the Political Quarterly journal. You can read the full article here. Harold D. Clarke is Ashbel Smith Professor, School of Economic, Political and Policy Sciences, University of Texas at Dallas.